Grace Misiti from Nature´s Variety will be hosting a one-hour seminar in our new clinic waiting room. 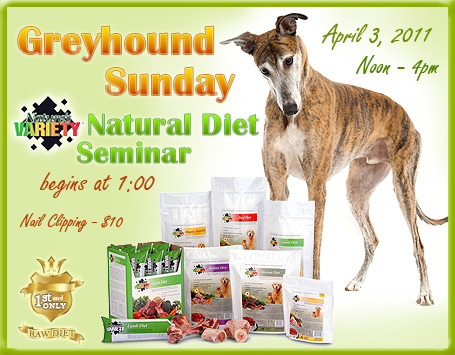 She will be discussing the history of dog nutrition and the advantages of a natural diet for your dog. All attendees will receive a raw diet sample bag. NGAP will be selling the raw diet in our new clinic. Nail clipping will be offered for $10.00. Prepay at our new store checkout (located next to the new waiting room). You will be issued a numbered ticket (first come, first served). Tours of the new surgical facility will be available throughout the event! We anticipate an inspection sometime this week and unless the inspector find something (ELSE!) we need a permit for, we will get our Certificate of Occupancy. Then we just have a few final things to complete and in a few weeks we should be open! We will then plan for a grand opening!